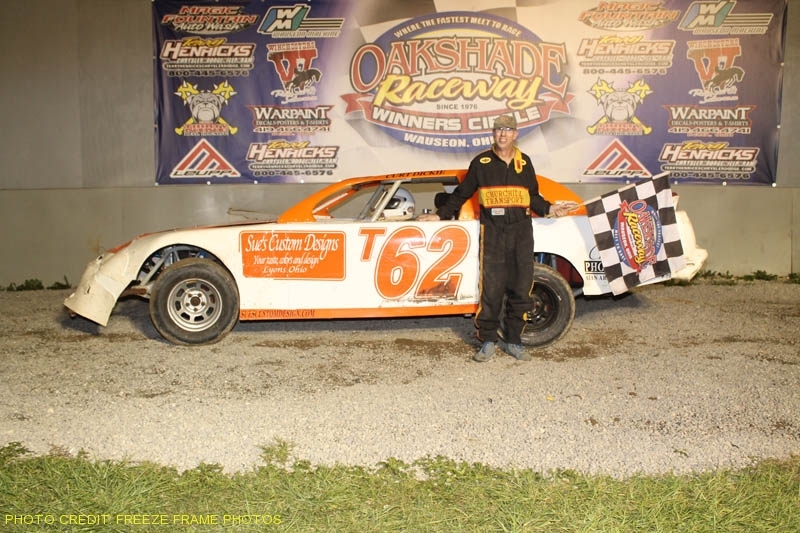 Clark Lake, Michigan’s Brian Ruhlman earned his second Oakshade Raceway UMP Late Model feature win of the year on Saturday night. Several make-up features from the previous week kicked off the evening’s racing program after the Vintage American Race Car four car dash. Last week’s make-up UMP Bomber B Main started with Donovan Paskan, Adam Noonan and Joe Overmyer racing three-wide for the lead. Paskan wound up leading the first lap, but Noonan took command on lap two. Noonan started an incredible night as the seventeen-year-old went on to win his first ever UMP Bomber B Main which would be the first of three wins on the night that included a heat race win. Paskan held on to finish second followed by Josh Montague, Jesse Moyer and Joe Overmyer. Drew Smith and Derek Morris had a hard fought battle for the lead in the make-up Hornet feature event. Smith led at the start with Morris closing in by lap four. The two drivers battled side by side much of the race and Morris took the lead at the white flag. Smith drove hard into turn three on the final lap, back to the inside of Morris. The two drivers made contact and came off turn four side by side again, but Morris held on to pick up the victory with Smith finishing a close second. William Cundick was third with Josh Froelich and Logan Hough rounding out the rest of the top five finishers. The final make-up feature, the UMP Bomber C Main, took the track next with rookie driver Dylan Herman grabbing the lead at the start. Herman could not maintain that lead as Satch Crispen took it away on lap five and didn’t look back. He was first to the checkered flag. Greg Detray was second followed by Tyler Line, Dylan Herman and David Goben. After a full set of heat races, feature time rolled around again with the UMP Late Models starting things off. Steve Kester snatched the lead from Ronnie Perrine, Jr. on the first lap, but Brian Ruhlman took command on lap two after starting fifth. Ruhlman went on to open up a decent lead on the rest of the field while Oakshade point leader Rusty Schlenk worked his way toward the front after starting 13th. Schlenk climbed to fourth by lap seven and then to second on lap 19 after moving around both Perrine and Kester. Schlenk then began to run down Ruhlman for the lead, but ran out of laps in his attempt to catch him as Ruhlman went on to pick up the win. Following Schlenk was Casey Noonan finishing third, Steve Kester fourth and Devin Shiels fifth. Brice Luttrell and Bruce Stuart put on a great show in the UMP Sportsman feature event. Luttrell gained the lead on lap four after getting by George Lindsey. Stuart started seventh and went to the lead on lap eight around the outside of Luttrell. Luttrell went back to the lead after Stuart got held up behind a lapped car on lap 18. Shortly thereafter, Bob Mayer and Jamie Grochowski wrecked in turn two which set up a two lap shootout to the finish with Luttrell leading. Luttrell held on to pick up his third feature win of the year over Stuart, Brett Miller, Tim Line and Rusty Smith. Adam Noonan picked up his third win of the night in the UMP Bomber A Main, which was his first ever A Main win. Tony Tolles, Jesse Moyer and Billy Brown, who was second in points, were involved in an accident on the backstretch on lap 11 ending all three drivers’ nights. Back up front, Noonan held on to take the checkered flag while Terry Rushlow and Jeff Foks had a hard fought battle for second near the end of the race that Rushlow held on beat Foks for the position. Point leader Jim Scout ended up fourth and Bob Krumm was fifth. The second Hornet feature of the night went much the same way as the first one at the beginning of the night with Drew Smith taking the initial lead. Smith opened up a big lead that was quickly gobbled up by Derek Morris who got alongside Smith with three laps to go. Morris got the lead with one lap remaining and held on to win his second feature of the night and the fourth one of the year. Smith finished second again and maintains his point lead by just 16 points over Morris. Jeff Geis led the UMP Bomber B Main from flag to flag and survived to pick up his second feature win of the year after a close finish. Tim McNicol was running third and spun in turn two on lap three putting him at the back of the pack for the restart. Matt Lane also saw his great run get cut short when he spun while battling with Garry Domoe for second on lap six. A few more cautions set up a one-lap dash to the finish that Geis was able to hold off Domoe on his way to the checkered flag. Donovan Paskan started tenth and ended up third followed by Allen Tolles and Joe Overmyer. Jack Wampler got crossed up in front of the field on the first lap of the UMP Bomber C Main and wrecked forcing a complete restart. Jamie Faller proceeded to jump out in front of the field at the start and never looked back on his way to his first feature win of the year. Shaun Sharp started deep in the field and climbed to finish a close second. Dave “Gumby” Golembieski crossed the finish line third followed by Gabe Mueller and Ron Travelbee. Oakshade Raceway will host another American Late Model Series event on Saturday, August 7 along with UMP Sportsmen, UMP Bombers and Hornets. A couple additional UMP Late Model events have also been added to the remaining 2010 race schedule including the UMP Late Model Push Trucks Dual Features on August 14th featuring two complete Late Model feature events and the UMP Late Models have also been added to the UMP Sportsman, UMP Bomber and Hornet Season Championship Night on September 11th. Gates open at 4pm with racing at 7pm for all those dates. Rusty Schlenk, Rich Ruff, Curt Lancaster and most of all a whole bunch of kids were the big winners on a rain shortened Night of Wheels at Oakshade Raceway. The smiles on the winners faces were wide as over 30 bicycles, scooters and wagons that were donated by drivers, crews, fans, etc. were randomly given away to the children in attendance during the weekly Links Zone intermission segment organized by Dan Rice. Once the Night of Wheels festivities concluded, it was UMP Late Model feature race time. 2008 Late Model Track Champion Rody Schroyer took command early in his first appearance of the year on the 3/8 mile dirt oval. Schroyer hadn’t missed a beat as he held the lead while fending off a couple challenges from Brian Ruhlman. Last week’s Birthday Race winner, Rusty Schlenk, began to charge to the front late in the race taking the second position on lap 14 and then went by Schroyer on the outside one lap later to take the lead. A lead he would not relinquish as he went on to win his seventh Oakshade feature win of the year in the caution-free event. Schroyer and Ruhlman held on to finish second and third respectively while Frank Heckenast Jr. from Frankfort, Illinois was fourth. Pole-sitter Brad Eitniear ended up fifth. The most exciting race of the night was by far the UMP Sportsman feature race. Brice Luttrell started on the pole and grabbed the early lead. After a caution for Bruce Stuart who spun on lap four, Luttrell had his hands full trying to hold off Rich Ruff and Mike Jessen who went to his inside and outside, three-wide for the lead. Jessen got the lead, but could not shake Ruff who continued to race to his inside. Ruff had the lead on lap seven, but Jessen regained the lead on lap 11 and the two drivers raced the remaining nine laps side by side. Ruff edged back ahead for the lead on lap 14 and Jessen once again got enough progress on the outside to claim the top spot on lap 17. Ruff fought back and on the final lap, it was Rich Ruff claiming his first feature win of the year narrowly beating out Mike Jessen. Rusty Smith climbed nine positions in the race to finish third followed by Brice Luttrell and Joe Derbeck. Brett Miller finished sixth, but won the Racer’s Connection/JT’s Automotive Dash for Cash earlier in the night where he earned $200 for the victory. Curt Lancaster was the story of the UMP Bomber A Main. He started on the outside of the front row and went on to lead the entire distance of a caution-free race to pick his first A Main win of the year and an additional $100 in memory of Bob Holbrook. Terry Rushlow finished strong in second while Billy Brown closed to within 33 points of the UMP Bomber point lead with his third place finish. Last week’s feature winner Jeff Foks came home fourth with Craig Dippman rounding out the top five finishers. Right at the conclusion of the UMP Bomber A Main, the skies began to open up with a light, but persistent rain. The track officials tried to wait it out, but the rain picked up and with the threat of even more rain on the way, it forced the postponement of the last three races of the night. Those races, the Hornet feature, UMP Bomber B Main and C Main will be run next week. The makeup B and C Mains will still pay an extra $100 to each winner in memory of Bob Holbrook. These races will be in addtion to a full show of UMP Late Models, UMP Sportmen, UMP Bombers and Hornets with an exhibition by the Vintage American Race Cars. It is also Scout Night so all scouts in uniform will receive free grandstand admission. Gates open at 4pm with racing at 7pm.